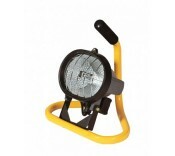 500w halogen fitting Tough oval design One-piece steel frame Soft grip handle 3m cable wi..
500w halogen fitting Tough oval design One piece steel frame Soft grip handle 3m cable &a..
500w halogen fitting Tough ovel design Robust steel tripod Adjustable from 1.5 - 2.5m 5m ..
2 x 500w halogen fittings Tough oval design Robust steel tripod Adjustable from 1.5m - 2.5m.. Inspection lamp with adjustable gripper 5m cable with 110v plug 60w bulb ES fitting &n.. Manufactured using 2.5mm cable 10 Bulb fittings and cages 10 60w bulbs included 22m cable w.. Replacement 400w Tungsten Halogen Tube 110v .. Replacement 400w Tungsten Halogen Tube 240v ..
Standard "GLS" style bulb with bayonet (BC) push and twist fitting for general purpose use. Cle..
Standard "GLS" style lamp with Edison Screw (ES) fitting for general purpose use Clear finish ..
Standard "GLS" style bulb with bayonet (BC) push and twist fitting for general purpose use. ..